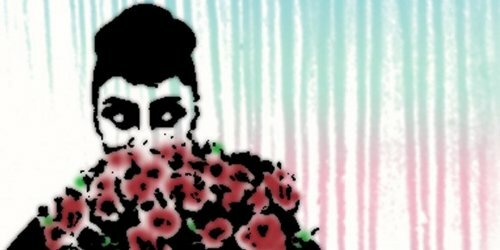 Just when I thought this season's wave of rose-inspired perfumes had tapered off, one more has come my way, and it's a very unusual example: Asphalt Rainbow, the second release from Brooklyn-based independent perfume brand Charenton Macerations. This fragrance was developed by perfumer Cecile Hua, and its notes include rose, spray paint (aerosols), galbanum, lily of the valley, lychee, ylang ylang, saffron, magnolia, leather, cistus, asphalt, "detritus," patchouli, wood and amber. 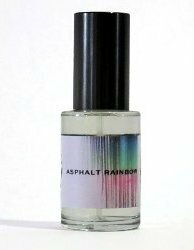 Asphalt Rainbow is described as "an olfactive love letter to the street: a roughed up rose that’s been hyper-colored, torn apart and twisted on its head, then nailed to the wall for your sniffing pleasure." It's actually discussed at much greater length on the Charenton Macerations website, in various posts that occasionally read like an M.F.A. thesis; once you sift through the verbiage, you can take away the idea that Asphalt Rainbow is designed as a homage to graffiti and street art of all kinds, an olfactory tribute to an art form that's vibrant and temporary and rebellious. Asphalt Rainbow's floral and leaf notes peek in and out of the metallic and earthy background, as though they were growing through a chain-link fence; layering is one of several concepts behind this fragrance, which doesn't evolve in a predictable manner. The patchouli is one of the more natural-smelling notes in this environment, and it joins the woodsy amber to push the rose into a deeper, warmer phase. Overall, Asphalt Rainbow is more androgynous than the fragrances I typically wear, but I've enjoyed experiencing it. It also has excellent staying power; it lasted through a work-day on my skin. Each bottle of Asphalt Rainbow is labeled with an iridescent sticker, rolled in a square of gray leather, and packed in a cardboard tube with a small sachet of dried roses. It's an industrial-bohemian presentation that suits the fragrance within. Charenton Macerations Asphalt Rainbow is available as 30 ml ($100) Eau de Parfum at Luckyscent, Twisted Lily and the Charenton Macerations website. 1 ml samples ($6) are also available. A really great review, Jessica, but I think I’ll give it a pass. They lost me at “asphalt”. Ha! Well, it’s not going to suit everyone’s taste. At least you realize that without having to sample or blind-buy! Thank you for the review – among other good things it did, it reminded me that I’ve wanted to order the Christopher Street sample for a long time. I’ll now add Asphalt Rainbow to my sample list – it sounds experimental, but also like there’s some thought behind it. I appreciate that they are not putting out 7 fragrances a month, like some brands seem to do. Annikky, I like your new (?) avatar photo! I agree — I much prefer to see a line (any line, whether niche or indie or mass-market) space out its new releases. Then I can “digest” them one by one. I went to Sephora today and I saw a whole new cocktail-themed line designed to be layered, and whole new Fred Segal line also designed to be layered, and I got an instant headache and left the store. Thank you, Jessica! Yes, the photo is new, as I’ve only just learned (embarrassingly) how to make a gravatar. I’ve been doing my own little thing online recently and it’s proving very educational. About the releases – I know exactly what you mean. In general, I’m cool about the fact that I can never try or even have an overview of all the perfumes out there, even the good ones. But sometimes I just get so overwhelmed that it temporarily kills all my enthusiasm for fragrances. Yes! That’s the one. “White” fragrances, and “black” fragrances, with a cocktail theme. They seem to be recycling ideas that other niche lines have been doing for years, but they’re pretty unusual for the Sephora fragrance wall! Great review, Jessica. I love the name, and as a New Yorker it’s wonderfully evocative. I rarely get interested in fragrance from a purely philosophical standpoint, and I often consider interesting fragrances to be just that, ie not something I’d wear but rather a provocative art form that is experienced as a smell. In this case, I’m really drawn to the work, and reading your Christopher Street review and the comments again has been mind-blowing. Thanks! Holly, the CM website makes a point of describing its fragrances as “olfactive storytelling,” which seems very accurate! Plus, as I’ve said before, I can never resist a NYC theme… although it something that’s not always done as well as it’s done here. I agree … it IS done well. Enough so that I’m intrigued.